This AzhwAr, who is called as dhIrga chinthayanthI (one who alternates between happiness and sadness repeatedly, just like chinthayanthi, the cowherd girl in gOkulam), alternates between happiness when he gets to experience emperumAn through his mind and sadness when he does not unite with emperumAn externally [physically]. In the previous pAsuram, he went the way of happiness and in this pAsuram, finding that emperumAn is not showing his divine form to him, suffers. Even though his desire for emperumAn developed only after taking his present physical form, it appears to AzhwAr that he had been having this desire to see emperumAn from time immemorial. enRum orunAL ozhiyAmai nAn irandhAl onRum irangAr urukkAttAr – I have been begging him from time immemorial, to see him; he (emperumAn) is not showing any mercy towards me, from wherever he is staying, thinking “Oh, he is beseeching me”; he is not showing me his divine form either. 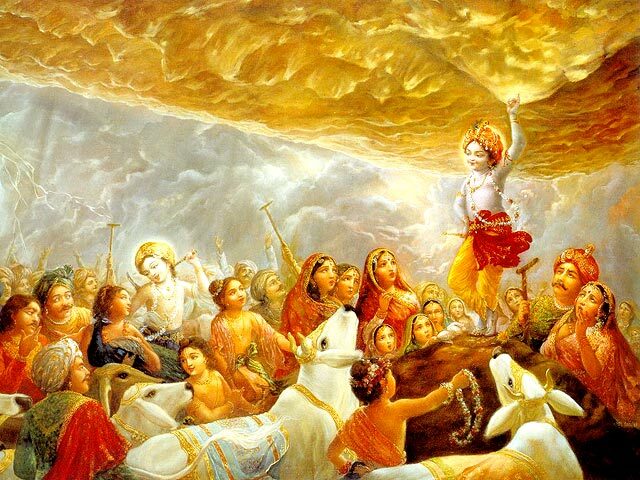 kunRu kudaiyAga AkAththa kOvalanAr – Isn’t he the one who protected cows by holding the hill gOvardhana like an umbrella? If he had not manifested himself to anyone, I could have comforted myself saying that he has not shown himself to me because of his nature. Isn’t the person, who showed himself up to cows who cannot even realise the great benefit that he had shown them, not showing himself to me and helping me? nenjE pudaidhAn peridhE puvi – Oh heart! Since he had protected cows, we cannot say that he does not have simplicity. It appears that we are located in a place where his simplicity does not flow (since we are on an elevated surface).By the word puvi, AzhwAr hints the place where he is staying and by the words pudai peridhE he hints that this place is much above the ground level. We will take up the 75th pAsuram next. This entry was posted in iyaRpA, periya thiruvandhAdhi on January 26, 2019 by T N Krishnan.